Gotham City citizens were unprepared for the reign of terror unleashed by The Joker. A self-proclaimed agent of anarchy, this chaotic clown acts and reacts without rules leaving a path of death and destruction in his ominous wake. Only The Batman has the tenacity to take on the purple and green fiend. The Dark Knight propels the Batman legacy to even greater heights on the strength of Heath Ledger's cinematic performance as The Joker. Bringing this evil character to life on screen was a challenge, and Ledger found a voice to articulate the twisted logic of this frightening criminal mastermind. The Scarecrow, Gotham crime mobsters, Asian financial launderers, plus Two Face. All these disrupters fouling Gotham City. And prepare yourself for Heath Ledger as The Joker! Batman has quite a heavy workload cut out for himself trying to save Gothamites from extreme evil and tremendous terror. The Dark Knight is showcases the acting talents of Christian Bale, Michael Caine, Gary Oldham, Morgan Freeman, Maggie Gyllenhaal and Aaron Eckhart. 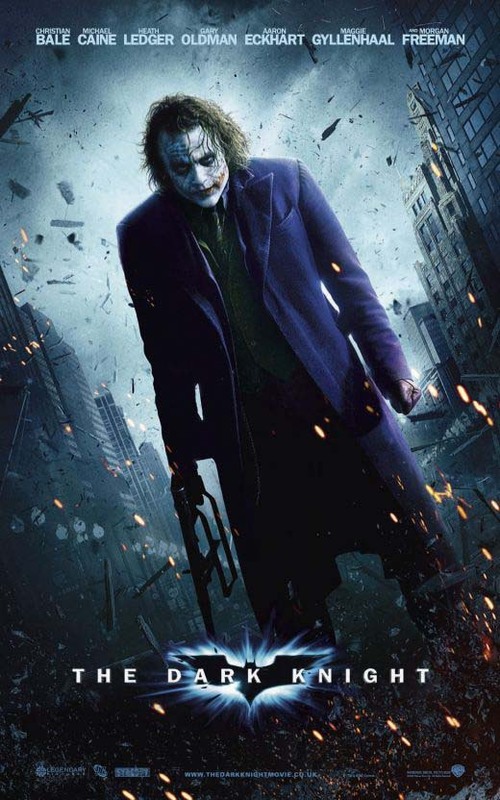 The Dark Knight takes the Batman film franchise to a whole new level of action, suspense and fear. There are chilling moments in this thrilling movie. Individual belief systems weighing right verses wrong create interpersonal friction between the characters. These conflicts form the basis of several subplots within the film. Go and check out the special WB film print provided to the Baltimore Senator Theatre to maximize the enhancement and enjoyment of this spectacular movie presentation. The confrontation between The Batman and The Joker is worth the price of admission alone.